If I did a good job, or was just lucky, or both, lambing will go reasonably well. Which means I will end up with about as many live lambs as ewes, I will lose 10 to 20% of the lambs that were conceived—to weather, or to birth trauma, or to predation, or to mis-mothering, or to other causes I don’t even know. It means that I will lose less than 1% of my 400-odd ewes to birthing difficulties, and have a similarly small number of “interventions”: lambs that need help to be born, or ewes that need help to rid themselves of dead foetuses. The statistics don’t sound too awful—in fact, for superfine merinos, notoriously finicky to lamb, the stats are pretty good, though the lamb mortality makes me want to cry every year. But the statistics can’t convey the real story—that every single day for six weeks I set out to go around the ewes and lambs with absolutely no idea of what I will find, and only 10 years’ experience to give me confidence that whatever I find I will cope with, somehow. There are as many ways to “manage” lambing as there are farmers—all the way from as hands-on as you can imagine to a Darwinian refusal to intervene at all. 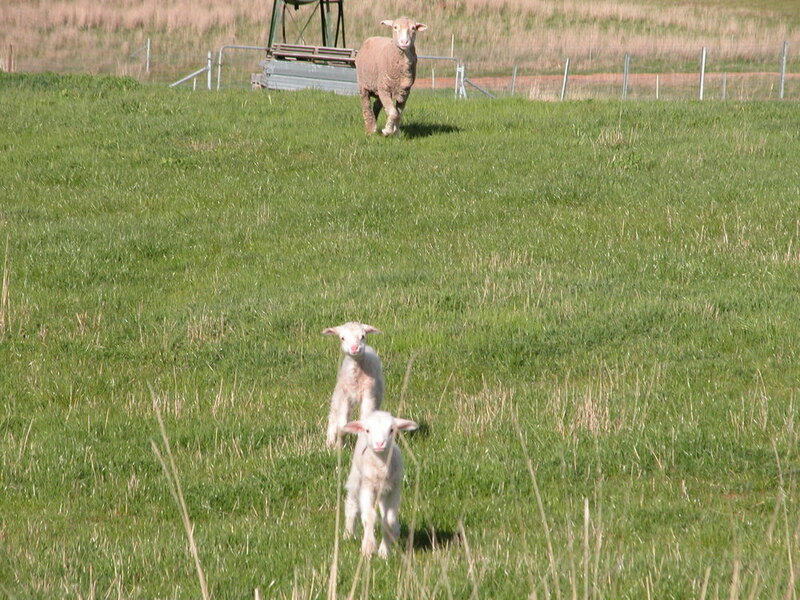 I’m on the minimum intervention end of the spectrum: I do my utmost to allow the ewes the quiet and privacy to lamb naturally and to establish the amazing connection between mother and baby that is key to the whole concept of nutritional wisdom. I stay well away from the ewes during lambing—checking them as carefully as I can through high-powered binoculars from whatever vantage points I can find that won’t disturb them. If I HAVE to intervene to save a ewe, I will, but I will try everything in my power not to cause disruption to other ewes nearby. And it is inevitable that I will miss seeing a ewe in trouble. Knowing that doesn’t make it any easier when I find a dead ewe that I could have saved, but simply didn’t find in time. This year, three weeks into lambing, I have two orphan lambs I am feeding: Felix, who was simply left behind—possibly a weaker twin—and Clara, found lying on the uphill side of her dead mama, sheltering from a wickedly cold gale. In between finding the two lambs, I saved Sabrina—just in the nick of time—“pulling” her large twin lambs, the first one stuck, both dead. Felix and Clara asking Sabrina’s permission to come to me for their bottles. Sabrina coming along to keep an eye on proceedings. Sabrina took a couple of days to get back on her feet, and doesn’t have enough milk for even one, let alone two, lambs. But bless her, she has adopted Felix and Clara, and is surprisingly gracious about sharing them with me. They come to me for their bottles, and she comes along to keep an eye on them. The rest of the time, she is watching over them while they sleep, and teaching them, with all the patience in the world, what it means to be a sheep.